I’m old enough to remember a time when Democrats knew how to substantively debate issues. I know that dates me but it’s worth mentioning. I even remember a time when Juan Williams was capable of participating in a substantive debate. Sadly, those days are gone. Greg Gutfeld’s argument was coherent. His predictions were right. Juan Williams’ arguments, by comparison, have utterly disappeared with time. The reason, in my theory, is that Democrats are great at reciting that day’s chanting points but they’re utterly inept at applying logic and data. The Democrats’ inability to grasp key principles is frightening. This isn’t my dad’s Democratic Party. This bunch isn’t nearly as smart and considerably less patriotic. This article is fascinating from the standpoint of exposing the next demographic group to exit the Democratic Party. New York’s 14th Congressional District is more than 70 percent people of color, and 50 percent Hispanic. Ocasio-Cortez, who was born in the Bronx to a Puerto Rican mother, fit the district’s changing demographics, and neatly fit a larger narrative of a national Democratic Party in which increasing progressivism and diversity go hand and hand. But a closer examination of the data tells a different story. Ocasio-Cortez’s best precincts were places like the neighborhood where Bonthius and his friends live: highly educated, whiter and richer than the district as a whole. In those neighborhoods, Ocasio-Cortez clobbered Crowley by 70 percent or more. Crowley’s best precincts, meanwhile, were the working-class African-American enclave of LeFrak City, where he got more than 60 percent of the vote, and portions of heavily Hispanic Corona. He pulled some of his best numbers in Ocasio-Cortez’s heavily Latino and African-American neighborhood of Parkchester, in the Bronx—beating her by more than 25 points on her home turf. Don’t be surprised if blue collar people of color are the next demographic group to leave the Democrats. It’s pretty clear that Keith Ellison knows a thing or two about being slippery. 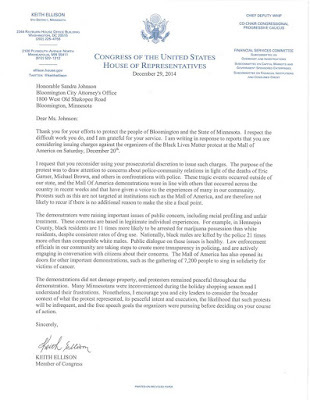 With a week left before Election Day, Keith Ellison is still attempting to slip away from Karen Monahan’s accusations. Ellison has denied the allegations, but the damage was done. Once leading Republican opponent Doug Wardlow in polls, Ellison trails by 7 percentage points in the most recent Minneapolis Star Tribune/MPR News survey. Still, Ellison has hope: the same poll shows 16 percent of voters say they’re not sure who they’ll choose. So there he was Thursday in the basement conference room at the state Capitol, imploring voters to examine Wardlow’s record instead of his own troubles. Ellison doesn’t have much hope. Most undecideds break away from well-known candidates. If they know who you are but are still undecided, that isn’t a vote of confidence. That’s a sign that voters aren’t satisfied with their options. Here’s mathematical proof that Ellison is in trouble. Let’s suppose that 1,000 likely voters were polled. If Ellison is getting 36% of the vote, then convinced 2/3rds of undecideds to vote him, which is highly unlikely, Ellison would finish with 467 votes. Wardlow is getting 43% of the vote. If he convinced 33% of the undecideds to vote for him, he’d finish with 483 votes. 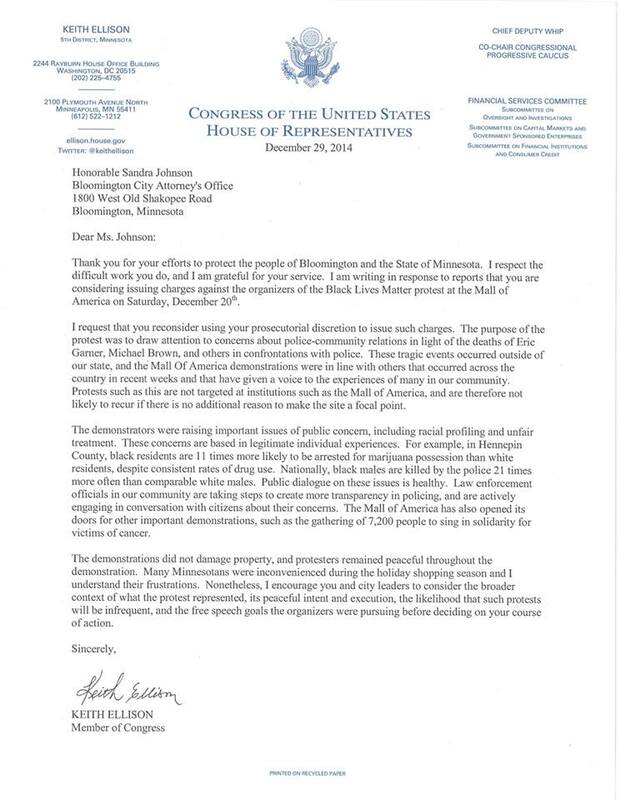 Then, too, so should Ellison’s statement that he wouldn’t uphold Minnesota laws he doesn’t like. It’s time to end Keith Ellison’s political career. I request that you reconsider using your prosecutorial discretion to issue such charges. The purpose of the protest was to draw attention to concerns about police-community relations in light of the deaths of Eric Garner, Michael Brown and others in confrontations with police. Does that sound like a letter who “values and honors all members of law enforcement”? It sounds more like something that a Black Lives Matter activist might say. Ellison said “If the state legislature passes laws that don’t make sense, but are constitutional, then I’m going to have to cross that bridge when I get to it.” That statement is what I’d expect from a narcissist who thinks he’s the ultimate decider of which laws get enforced and which once won’t. Ellison isn’t arguing for the principle of prosecutorial discretion. He didn’t mention a lack of resources. Specifically, Ellison talked about laws “that don’t make sense” but that are constitutional. Who gives him the authority to determine which laws makes sense? I’m certain that Minnesota’s Constitution doesn’t. What are Ellison’s criteria for judging which laws make sense? If Democrats want to sue President Trump, then let them raise the money and open their own law firm. Minnesota’s taxpayers shouldn’t pay the price for Keith Ellison’s or the Democrats’ activism. The choice couldn’t be clearer. A vote for Keith Ellison is a vote for advancing the Democrats’ agenda of obstructing President Trump by any means necessary. A vote for Doug Wardlow is a vote to restore law and order in Minnesota. “In Jason’s time in Congress he has cast repeated votes in support of Davis-Bacon prevailing wage and has led on the issue of changing school curriculum to encourage more people to look at careers in the construction industry,” carpenters’ spokesman Adam Duininck said in a release. This is a major victory for Lewis. This can’t help Angie Craig. Does anyone seriously think he cares about the people killed by this gunman? I certainly don’t. 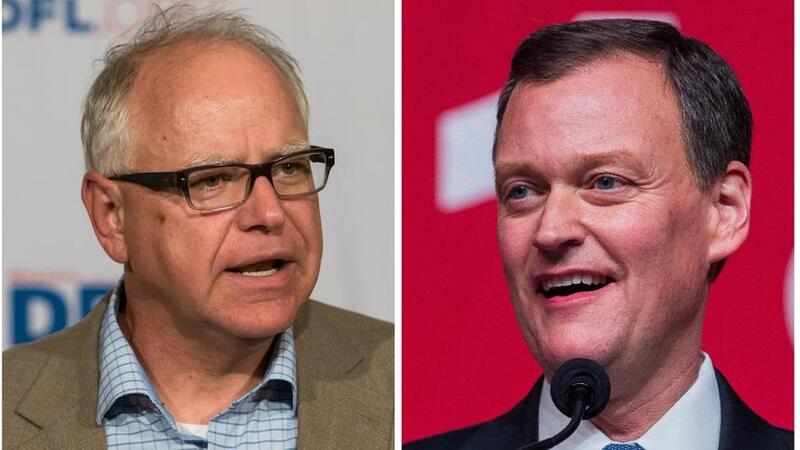 This is just another attempt by Walz to curry favor with the gun grabber fringe in the DFL. As we learn more about what’s happened in Pittsburgh, my heart goes out to the victims, loved ones, first responders, and Jewish community at large. This is a pain that is all too familiar in America. We can and must take action to reduce gun violence in our communities. It’s clear that Tim Walz has gone from being a reliable vote for the NRA to being a reliable vote for Michael Bloomberg. He’s no longer a centrist. He’s a leftist. On Nov. 6, it’s time to retire Tim Walz, Tina Smith and Keith Ellison. For months, we’ve been told that the Democrats’ blue wave would swamp Republicans. We’ve known for awhile that this was more wishful thinking than reality but that’s what we’d been told. Salena Zito, the woman who accurately predicted Trump’s victory, wrote this article, which states a contrarian theory. The Kavanaugh fight might have re-sparked the old torches. As Democrats and the press came after the Supreme Court nominee and things looked bleak, Trump picked up the fallen flag of a Republican Party in retreat and charged the Establishment. And then, Lindsey Graham and the Republicans on that committee said, Follow him! And voters all around the country said, Follow them! Like it or not, you have to view sentiments through the eyes of the voters who live outside D.C. and New York, who live in the swing districts and states that voted for Trump. They saw, for the first time, Republicans grow a spine and actually stand up angrily and loudly against Washington. It was sort of like a Hell yeah, that’s why we sent Trump there moment. 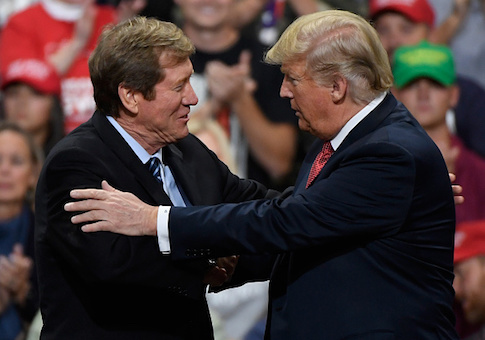 The un-energized Trump voters who don’t particularly like Republican or Democratic members of Congress decided they did like the party that stood up and fought against a mob leading a very Washington character assassination. The blue wave died because Republicans, thanks to Trump, grew a spine and started standing up to Democrats. More and more each day, Republicans are going on the offensive. They’re highlighting how nutty the Democrats’ policies are. 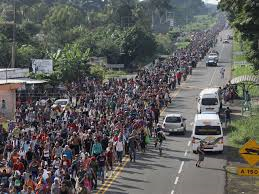 President Trump has done a great job of painting the Democrats as the ‘Open Borders Party’. When people are polled about immigration, they usually say that Democrats do a better job. When they’re asked who does a better job with border security, Republicans win handily. With a migrant mob approaching, people understand that they’re trying to overwhelm the system. They’ll oppose that 100% of the time. Jim van Houten’s article for Alpha News is important reading for all Republicans statewide. First, it’s focused on getting out Metro voters. While I staunchly agree that it’s important to increase GOP metro voting, I’m of the strong belief that we should increase GOP voting everywhere in Minnesota. In November 2016 Hillary Clinton won Minnesota’s presidential electoral majority by just a tiny 1.67 percentage points. However, in the metro, she beat Trump 70 to 30%, a huge 40 percentage point margin of victory in a medium sized voter segment. Trump won the remainder of the state by a margin of 58 to 42%, a smaller, but still significant, 16 percentage point margin. There are two critically important implications from these data: First, if Trump had increased his metro share of the 870,000 metro votes cast by 5.2%, his share of the metro vote would have increased only modestly to 35.4% from his actual 30.2% share. This small shift would have given Trump victory in the entire state of Minnesota. In 2010, an even smaller metro increase would have made Emmer rather than Dayton our governor. Too many Minnesota Republicans think that we can’t win because the DFL always wins Hennepin and Ramsey counties. While it’s true that the DFL wins those counties, it’s equally true that Republicans own rural Minnesota. After the 2016 election, I checked out the Minnesota House races for the size of the margin of victory for Republicans in rural Minnesota. The size of the margins astonished me. Check them out yourself. In 2016, Mary Franson won with 65% of the vote. In 2012, Mary won by 12 votes. That’s an improvement of 6,775 votes. Here’s why this matters. If Tim Walz is elected governor, there’s a strong chance that he’ll shut down government if Republicans don’t agree to raise taxes and spending. There’s also no proof that he’ll hold oversized government accountable. Does anyone seriously think that Tim Walz will stand up to the public employee unions who run these departments? Can anyone picture him fixing MNLARS? That’s laughable. If Republicans get out and vote like this is the most important midterm election in recent history, we have a chance to dramatically change the structure and performance of state government for a decade or more. Walz replied “We need a redistricting policy that is transparent, accountable, and based on sound research and policy. I support a redistricting process that involves communities and ensures that it empowers people and their votes.” What type of mumbo-jumbo gobbledygook answer is that? I have no idea what that means. Article IV Section 3 of the Minnesota Constitution says “the Legislature shall have the power to prescribe the bounds of congressional and legislative districts” so I would have a hard time handing over this power to an unelected commission or panel. In other states where this has been tried, the redistricting panels sometimes ended up more partisan and political than the Legislature. I believe the legislative process can work if we stick to redistricting principles such as equal population, compactness and preserving communities of interest. In other words, Jeff Johnson believes in a process that requires accountability and eliminates as much partisanship as possible. Who knows what Tim Walz wants? Do you support gun reform, such as red flag laws? Why or why not? JOHNSON: People deserve to feel safe in their homes, their schools and on the streets. Red flag laws can be a part of the solution to reducing gun violence perpetrated by troubled people as long as there is due process for these individuals in place. More broadly, however, I don’t believe the answer to violence in our society is further restricting Minnesotans’ Second Amendment rights but rather to start addressing the difficult issues that are leading to this violence, such as family breakdown, mental illness, a pop culture drenched in violence and even school policies that ignore disruptive and violent behavior. WALZ: As a sportsman, veteran and Moms Demand Action Gun Sense Candidate, I believe I am uniquely positioned to build the coalitions necessary to finally get something done on this critical issue. As governor, I would fight for common-sense gun reforms, including criminal background checks, an assault weapons ban, red flag laws and funding for gun violence research. We can do these things while protecting responsible gun ownership. Walz once had credibility on Second Amendment issues. Then he chose to run for statewide office. In so doing, he abandoned law-abiding gun owners. Meanwhile, it’s totally apparent that Jeff Johnson wants to go after the root causes of gun violence rather than passing do-nothing bills that won’t have any effect on actual gun violence. In short, Tim Walz isn’t a solutions-oriented candidate. He’s the empty suit candidate. Jeff Johnson is the solutions-oriented candidate. That’s who I’m voting for.